Fennel seed provides Vitamin A, C and E in addition to antioxidants. Ideal for cockatiels, lovebirds and similar sized parrot species. Features in shell sunflower seeds, grown organically in B.C. Offered in moderation, sunflower seeds are a rich source of Vitamin E and protein. Fennel seed, related to parsley, provides Vitamin A, C and E in addition to antioxidants. 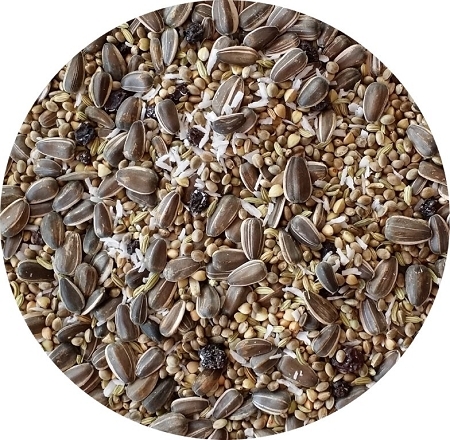 Fennel gives this seed mix a unique and beak tempting aroma. Hemp seeds offer balanced Omega 3 and Omega 6 fatty acids, and are much easier to digest than soy. In addition, hemp seed helps to boost the immune system with it’s Omega 9. Sunflower seed, buckwheat, hemp seed, currants, coconut, fennel seed.